The Cycling Ireland National Road Series has introduced a new €300 Team Classification, and €600 to the winners of both the Men's and Women's General Classification, amongst several improvements for 2019. 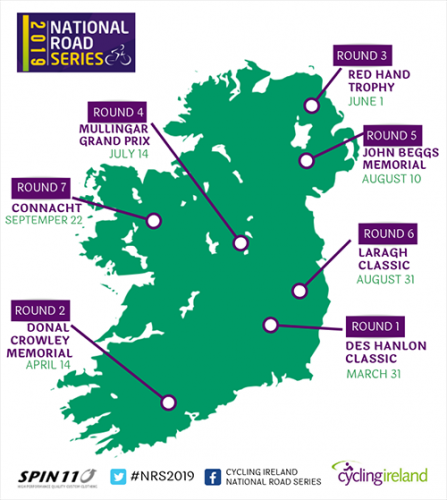 Run by the Cycling Ireland Road Commission, this year's National Road Series points structure has been changed to increase competitiveness, and that new Team Classification added, with points in the competition adding up towards an overall prize of €300. There will be seven rounds beginning in Carlow on March 31 with the 38th Des Hanlon Memorial Classic. Men's and Women's races will be run on the same courses for the second year, with Irish custom clothing company Spin 11 providing Leaders' Jerseys for both General Classifications. During the series, the Road Commission will scout for its Men's and Women's teams for the Kreiz Breizh Elites Road Races in Brittany. That's the main target, but the Road Commission will also be selecting riders based on National Road Series performances for other races throughout the road racing season. Last year Aine Donegan, a newcomer to road racing who won the Women's National Road Series, made her Irish team debut at the KBE. The Men's GC was won by former hurler Conor Hennebry from Waterford. The final round in Connacht has not been finalised but will take place on September 22. A venue, route, and host club will be revealed in due course.